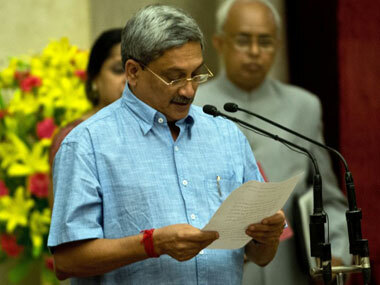 Goa News |Will Parrikar cut 'defense' babus to size? Will Defence Minister Manohar Parrikar be able to break the bureaucratic stranglehold over the defence services and restore to them their due dignity? This would be one of his major challenges in his new job. The suffocating control of the babus with no expertise in military matters in all major decisions pertaining to the forces - from purchases to administrative issues - has had a demoralisng effect on the latter. With a government overtly sympathetic to them, the expectations are high. According to a cross section of former senior personnel from the Indian Army, Navy and Air Force, the South Block at Raisina Hill — the seat of the MoD — is in total control of bureaucrats, with the defence secretary at the top, who is an Indian Administrative Service officer. The biggest task for the technocrat-politician, they believe, would be to bring the chiefs of defence services at par with his ministry’s secretary and joint secretaries, when it comes to taking major decisions. “The post of a defence secretary, who’s an IAS officer, is now redundant. It should be replaced by any top personnel from the services, because defence sector needs a specialist and not a generalist. The present NDA government and the new defence minister need to take up this issue of reforming the existing system on top priority. The national defence can’t be compromised at the hands of babudom,” former director, Centre for Land Warfare & Securities, Maj Gen (retd) Dhruv Katoch said. The dominance of the bureaucracy with babus doggedly guarding their turf vis-à-vis the personnel has resulted in no integration of servicemen in the defence ministry, no coordination in developing a mechanism or framework for formulating strategic policies and no unified commands. In promotion matters too the defence personnel have been getting a short-shrift. Many of those who spoke to Firstpost felt the inclusion of defence personnel in the topmost decision-making body would help in putting the real issues and problems before the minister, which otherwise get lost in the bureaucratic maze. “Unlike a bureaucrat, an Army officer has practical knowledge due to field experience. Moreover, border issues are becoming increasingly sensitive and those need specialists from defence to address them on priority basis,” a former Military Intelligence official remarked. Another important area that ex-defence personnel feel needs immediate attention of Parikkar is eliminating the deficiency of arms, ammunition and equipment like radar, telecommunication gadgets, etc, in the forces. This decision regarding procuring such crucial operational equipment again is often caught in bureaucratic dilly-dallying. “There is an immediate need to make up the ‘operational void’ – the critical hollowness or deficiency of arms, ammunition, equipment etc, or else this causes severe impediment for a regiment,” said defence analyst Brig (retd) Gurmeet Kanwal. Reminiscing the previous NDA era, Kanwal said former PM Atal Behari Vajpayee during his tenure used to meet all the three chiefs of defence staff once a month. Whereas, the then defence minister George Fernandez used to have a weekly meeting over morning tea known as Raksha Mantri Weekly Meeting with all the three chiefs and the defence secretary. “The new minister should follow something similar, to sort out issues and undertake a review to formulate a comprehensive national security strategy,” added Kanwal. Given Parikkar’s IIT background, it’s expected that he would go for modernization across all the services, which has reached stagnation. “Since he understands technology, he should focus on underperforming defence PSUs and Ordnance factories, which operate in captive market. Modernization is must and these units should be allowed to operate in open market, with greater accountability,” a defence source said. Next, on his priority list should be immediate appointment of the chief of defence staff, which the services officials, think would expedite major decisions, which lie pending in the files tucked away in the ministry.